I'm really proud of my sweet wife, Alexandra. She has just launched a wonderful new endeavor called Glassiette. 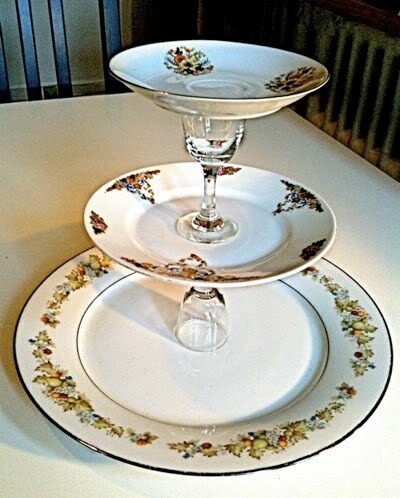 Alex sources lovely vintage dishware and artfully glues matching plates and glasses together with non-toxic, food-safe super-glue to create one-of-a-kind multi-level tray assemblies. The name Glassiette is a little combo I came up with melding the word glass and assiette (French for plate). She loved the name and it stuck like non-toxic, food-safe super-glue. These unique trays can be used to serve hors d'oeuvres, desserts, cupcakes or even to store your make up or small tchatchkes. Read more about the Glassiette experience and where you can buy them for yourself or as gifts, at the Glassiette Blog.